The Monty Python movie And Now, for Something Completely Different, which contains sketches from the group's Flying Circus TV show, is in my opinion a classic example of ADHD-like symptoms - do something, lose focus and switch to something else - in a series of confusing segues. It's been 2 months since Obama dropped the proposed axe on Constellation, and after reading, hearing and watching a lot of opinions about it, I'm left with a feeling that this is just one more jerking motion of a space policy in a series of other jerks and twists that can be labeled as the U.S. ADHD space policy. ADHD, in layman terms, is a problem with inattentiveness, over-activity, impulsivity, or a combination. In other words, lack of focus, and if I might add, lack of continuity in the case at hand. So whose ADHD is this? Well, I'd like to suggest that it is not so much the people involved, but the system, the set of rules that these people are bound to. Sure, Bush Jr. put Constellation in motion and Obama made it clear before even being elected that NASA is not a priority for this administration (what was not received that well in some states like Florida and somewhat reversed later...) and then in the suggested budget proposal, now debated in the house of representatives, he pretty much cut Constellation and flushed it down the toilet, but why did he do that? Why did Bush Jr. do that? Well, simply put, because they can, or maybe more accurately even are coerced to by the system. Imagine having a different parent growing up every four or eight years consistently. Until you're 18, you will have had three to five fathers and the same amount of mothers, each with their agendas, aspirations and hopes for you as their child. Now, as an example, consider the time it takes to become great at something as a child - piano, soccer, baseball, swimming, etc. It takes a long time of persistent vision, focus and continuity, which parents usually lay out for their child or at least affect it, consciously or inadvertently. Complicated enough? Not quite. Let's assume that once a year your revolving parents need to go to 200 people and ask for money for what they want for their kids, something not unheard of, by the way, in an Israeli Kibbutz a few decades ago due to the Kibbutz shared-property nature. Last but not least, the child we're talking about is one of twenty. Not a perfect analogy, I'll concede to that, but I think it's close enough. A child in such a reality would almost invariably suffer from all kinds of disorders, and a life pretty similar to our space policy over the years. It doesn't take a year to develop a rocket, a capsule or a space station module. It can be a decade for space related technology or system to mature, and in a lot of cases even more. Heck, I'm in the software industry and I can tell you first hand that even software (where failures don't kill people) takes more than a year to develop. To pursue space exploration and leap over the rocket science developed for the Nazi war machine and adapted to the cold war will take a long time. In a reality where nothing is allowed to be planned long-term and be backed by money, American space exploration has been suffering from uncertainty and cancellation of projects. Even worse, there is not even enough continuity - of vision, gradual improvement and focus. Teach a child Spanish. After a year teach that child French, completely halting study of Spanish. Continue that for 10 years, each year completely stopping with the previous year language studies. Will that end up producing a polyglot? Why was the shuttle created and then abandoned? 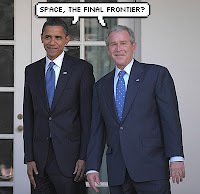 Where's version 2.0 (no, I don't mean the X-37B)? Why don't car manufacturers build a car, then a walking one like in Star Wars, and then a flying vehicle? Why even in the science-fiction world, where imagination can run wild, there were several Enterprise ships? Because it makes sense to build on previous technology, gradually improving and perfecting it. I'm not ruling out new technology, but even with disruptive technology, continuity still persists with other parts of a complex system.